Here at Lights In The Dark I typically keep the articles and information to exploration occurring within our Solar System. But there have been amazing advances in the discovery of worlds far beyond our own family of planets and this recent news is quite fascinating: astronomers have spotted what appears to be a large gaseous exoplanet in the process of formation around a star only 335 light-years away — literally one of our own cosmic neighbors! Not only is this serendipitous, but also provides insight to how the planets and moons in our own Solar System may have formed, 4.6 billion years ago. An international team of scientists led by a Clemson University astrophysicist has discovered new evidence that planets are forming around a star about 335 light-years from Earth. The team found carbon monoxide emission that strongly suggests a planet is orbiting a relatively young star known as HD100546. The candidate planet is the second that astronomers have discovered orbiting the star. Theories of how planets form are well developed. But if the new study’s findings are confirmed, the activity around HD100546 would mark one of the first times astronomers have been able to directly observe planet formation happening. New discoveries from the star could allow astronomers to test their theories and learn more about the formation of solar systems, including our own, said Sean Brittain, an associate professor of astronomy and astrophysics at Clemson. “This system is very close to Earth, relative to other disk systems,” he said. “We’re able to study it at a level of detail that you can’t do with more distant stars. This is the first system where we’ve been able to do this. 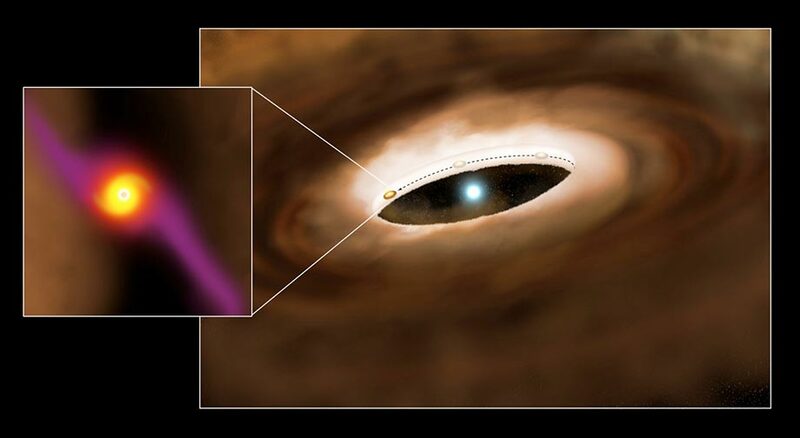 Evidence of another planet forming was previously found farther out from HD100546. A blob of gas and dust that has grown denser over time was discovered about the distance Pluto is from the sun. Members of the team reported their findings in a recent edition of The Astrophysical Journal.